I don’t usually eat out in Dubai much preferring to cook at home. However, on this particular evening, I was feeling particularly lazy and so decided to head out for dinner. Many friends and colleagues had mentioned Sicilia as a good choice for Italian food and being relatively close to my home, I packed my notebook, camera and appetite and went out! I arrived at the restaurant without a booking and there was no need to wait for a seat. The hostess seated me and before even offering a drink she proceeded to immediately point out the items that were NOT available on the menu. I had not even looked through the menu but I knew exactly what was not available – how bizarre. Once left alone I could take a minute to absorb my surroundings. I have eaten in trattorias all over Italy and, honestly, there was nothing Italian at all about this place. It was simply a standard hotel dining room where obviously very little thought and/or effort went into this very clinical, extra bright space. The waiter finally came round to take my order and immediately reached into his back pocket flipped open his notebook and asked “are you ready?”. There was no greeting, introduction, any mention of any specials or recommendations. When I asked about how the Roasted Octopus was cooked, he simply looked over my shoulder and simply read the menu description word-for-word, including the bit that said “green sauce”. I was trying to get an idea as to what the “green sauce” was! Obviously, he had no idea about the food he was serving. Well, I decided on the Roasted Octopus as an appetizer along with the mysterious green sauce. The dish itself arrived in a reasonable amount of time and at first glance looked fairly attractive. But then I started to notice a few things. In plain sight, there were four very large distinct lemon pips on the tentacles and, out of the three pieces of “crispy baby potatoes”, two were burned with one burned to black and totally inedible. Don’t believe me? Have a close look at the picture – it’s all there. For a chef to let a plate like this be served out of his kitchen is a total embarrassment. 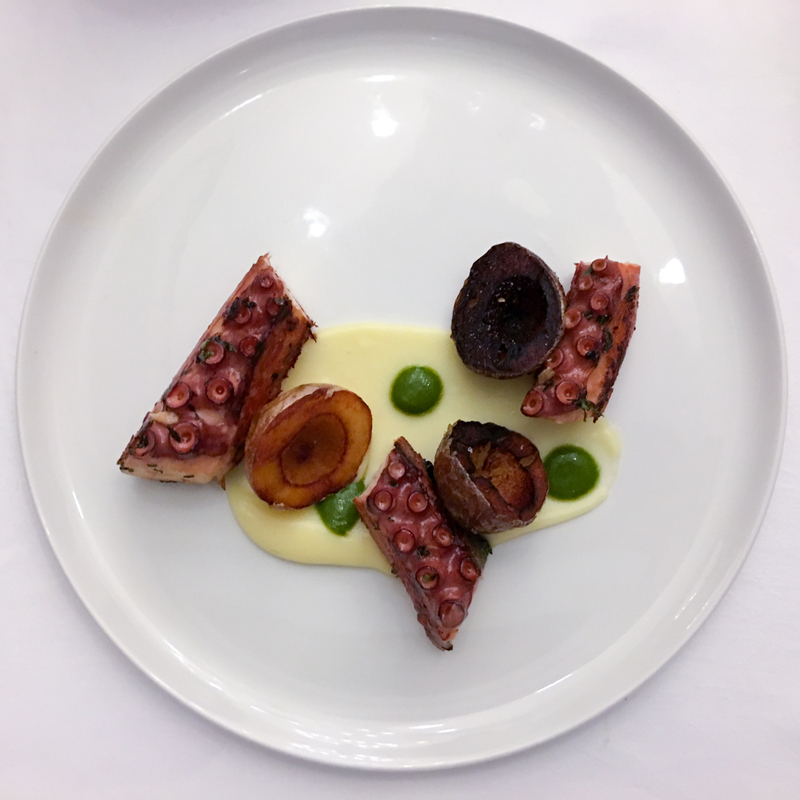 The octopus was roasted well and served with an overly citrus potato emulsion and I still do not know what the green sauce is. Honestly, I felt like leaving now but decided to keep on going. For a pasta course, I ordered the Homemade Roasted Veal Ravioli and was not expecting much at all. 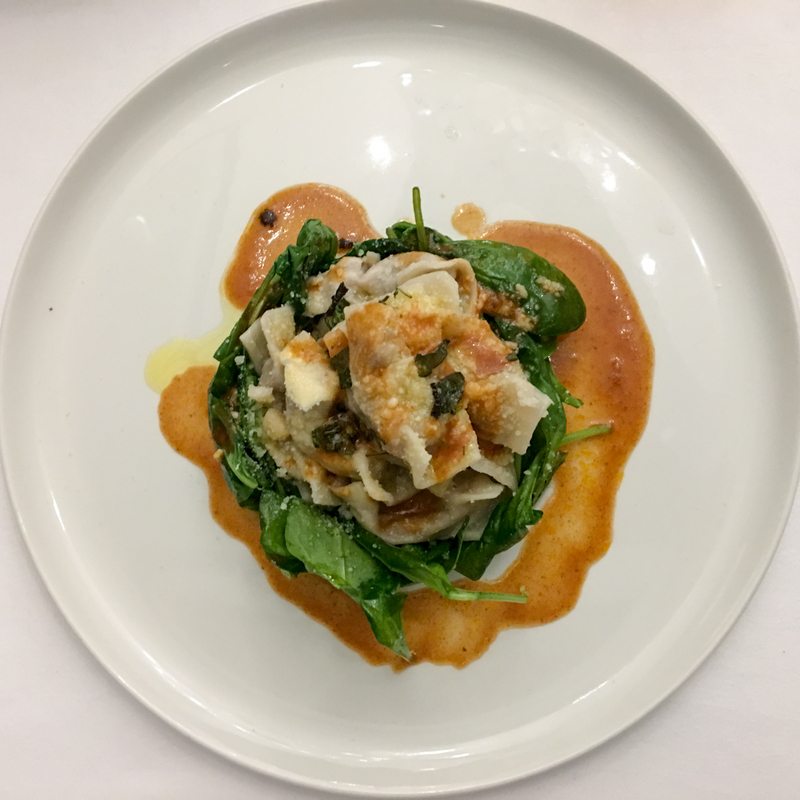 A very healthy portion of ravioli sitting in a nest of baby spinach was brought. To give credit where credit is due this dish was quite pleasant. The fresh ravioli was stuffed with shredded roast veal and pears. It was a delightful mix and a dish that was quite tasty, if not quite large for a pasta course. The baby spinach, too, was not overly wilted so still had some crunch. Now I was confused. With confusion reigning in my mind, I moved onto a fish course and my new waiter (much better than the first), suggested I try the Sea Bass. 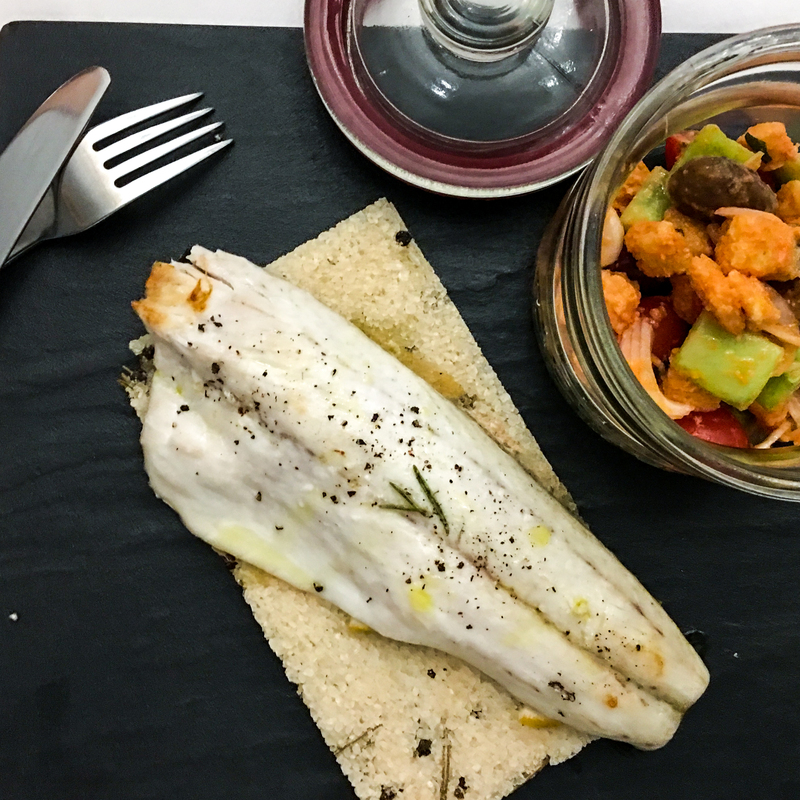 The fish was presented in an interesting way on a crusted bed of sea salt and rosemary, with a panzanella salad in a jar. Well, it was nice to see a little effort being made. The fish was cooked well but seasoned poorly – it was bland. There was a lot of promise with gestures made of sea salt, rosemary and abundant lemon slices but none of these flavours made it into the bland filet. The panzanella salad had simply become too soggy and was simply mushy. Again, a poor dish. Against my better judgement I decided to order dessert. I guess I really wanted to find something positive to talk about here. The recommendation was to try the Apple Rennete – it did sound interesting indeed. 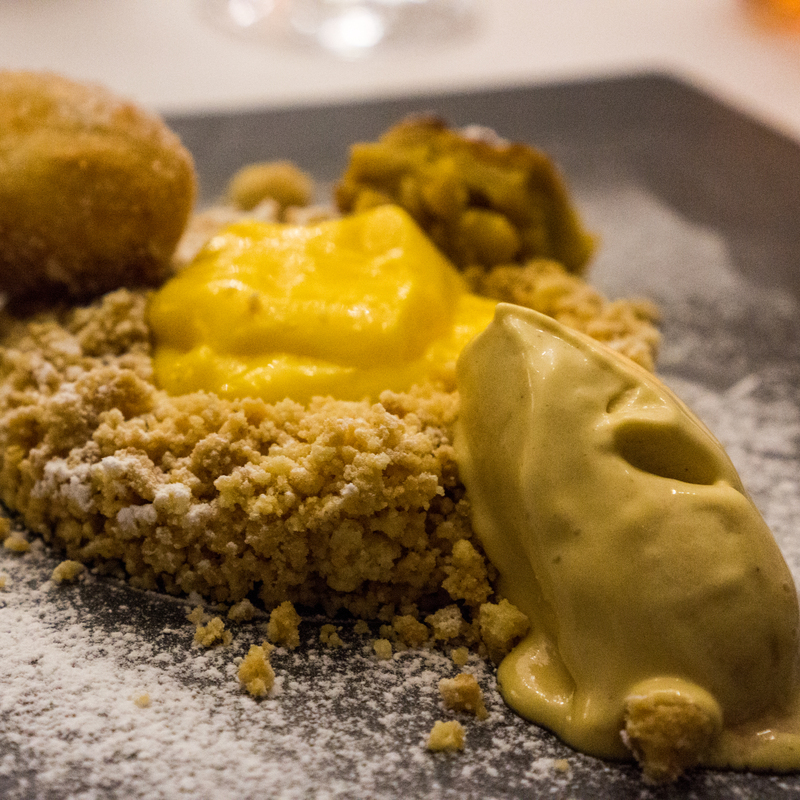 Basically, I was served a de-constructed apple pie and even though some effort went into making the dish look presentable, the tastes and textures were way off the mark – thoroughly disappointing. Sicilia, is a ‘Very Poor’ restaurant. The pasta may have saved them a bit this day and perhaps the pizzas are good (I didn’t try them) but the other food was poor and obviously comes from the kitchen of an either inattentive or ambivalent chef. The service is disjointed and the servers lack the knowledge to be servers in this five star hotel. The environment is unwelcoming and harsh and the prices reflect very poor value. I simply can not recommend Sicilia. Filed Under: Dubai, Restaurant Review, U. A. E.
I love traveling and I enjoy your blog.